If you look at U.S. Presidential elections throughout history, you will see a few familiar themes. One of the biggest is the prevalence of “political outsiders” who rail against the “corrupt insiders and elites” because they do not know how to make the country work for the average citizen. These calls have come from ideological opposites such as Andrew Jackson, William Jennings Bryan, Teddy Roosevelt, George Wallace, movements like the Tea Party and Occupy Wall Street, and even Bernie Sanders and Donald Trump in 2016. 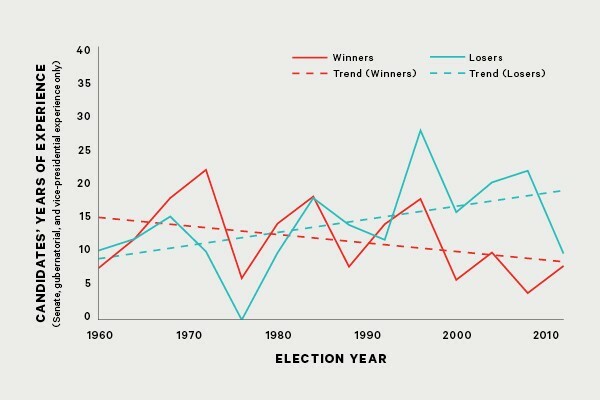 While almost every candidate for the Presidency post-Watergate (and especially in the 2016 campaign) has tried to label themselves as an “outsider,” the success of these candidates has been mixed but steadily improving, as this graph from The Atlantic shows. In many ways, this trend culminated with the Republican nomination of Donald Trump, who had no political experience before his campaign. Pundits were quick to declare that 2016 was the “Year of the Outsider,” which was a fair assessment given the successes of Sanders and Trump. Why is claiming to be an outsider so mainstream in American politics and what helps that message resonate? The answer lies in the political ideology, or more accurately philosophy, of populism. Populism is a broad term that is somewhat hard to pin down, precisely because it does not fit easily into a left-right ideological spectrum – how can something used to describe Barack Obama, Hugo Chávez, and Jean Marie Le Pen? That is because populism has no liberal or conservative ideological tenets. Populism can be defined as a belief in the power of regular people, and in their right to have control over their government rather than a small group of insiders or elites – be they political, cultural, or economic – and the “system” must radically change accordingly. Throughout history and across the world, populist leaders and movements have campaigned in vastly different ways, and 2016 is no exception. Bernie Sanders and Elizabeth Warren decry the evils of Wall Street and the “One Percent” while Donald Trump demonizes immigrants to arrive at similar conclusions that a political system of distant elites does not truly care about the average citizen. In Europe, the term is most often used to characterize cultural nationalists and right-wing politicians like Le Pen and Nigel Farage. In Latin America, it is more closely allied with figures such as Hugo Chávez and Juan Perón – politicians who are economic nationalists “looking out for the little guy” being exploited by international corporations. The United States has seen both types of populists throughout its history, sometimes even at the same time. This year, Donald Trump fits more into the European model of populism (though he also employs an economically nationalist message) while Bernie Sanders is much more in the vein of a Latin American populist. In 1828, Andrew Jackson and John Quincy Adams were set for a rematch of the 1824 election, which Adams won thanks to a vote in the House of Representatives. Adams was the quintessential insider: not only was he the incumbent, he was also the son of a President; a former Ambassador to Russia, Prussia, and the Netherlands; and a Senator by the time of the 1828 election. He had been out of politics for only two years since his 27th birthday. Jackson had been a politician before his election, but was best known for his leadership on the battlefield during the War of 1812, especially at the Battle of New Orleans. Jackson campaigned for a strong Presidency to serve as a bastion against an elitist and “aristocratic” Congress and their interests. While in office, Jackson crusaded against government spending and favoritism (though established a patronage system), because he viewed it as “anti-democratic” and selectively benefitting the rich elites of America. This is perhaps best seen in his one-man war against the National Bank. Jackson’s Democratic Party coalesced a base of farmers, urban laborers, and religious minorities in order to build a party organization that stretched from the local to federal level, allegedly representing the grass roots. Jackson’s outsider and populist message would likely not have had as much resonance if not for the electoral reforms that characterized the early 1800s. The franchise was greatly expanded as states eliminated the property requirements for suffrage. While the vast majority of Americans were still not eligible to vote, the nearly ten percent who did in 1828 was almost triple the turnout for any other U.S. Presidential election to that point. Additionally, reforms made direct election of state offices and members of the Electoral College more prevalent. While Jackson and the Democrats did not create these changes (by 1832, all states except South Carolina elected Presidential Electors directly), they did use them to their advantage. While populism again became a force in the 1850s with the Know-Nothing Party and their anti-immigrant rhetoric, it truly came to the forefront of American politics in the 1890s with the founding of the People’s Party in 1891, its merger with the Democratic Party in 1896, and William Jennings Bryan’s famous “Cross of Gold” speech at the 1896 Democratic National Convention. The People’s Party grew out of an alliance of farmers and unions and ran in one election before merging with the Democrats in 1896. Their 1892 platform declared that they “seek to restore the government of the Republic to the hands of the ‘plain people’” in the face of rampant corruption. Populism was not solely a phenomenon of the Democratic Party. Dissatisfied with the Republican Party, Theodore Roosevelt formed the Bull Moose Party in 1912 and Robert LaFollette, Sr., formed the Progressive Party in 1924. Both of these new parties took a decisively populist tone from the beginning. For example, Roosevelt’s 1912 Bull Moose Party platform declared that: “Political parties exist to secure responsible government and to execute the will of the people. From these great tasks both of the old parties have turned aside. Instead of instruments to promote the general welfare, they have become the tools of corrupt interests which use them impartially to serve their selfish purposes. Behind the ostensible government sits enthroned an invisible government, owing no allegiance and acknowledging no responsibility to the people. To destroy this invisible government, to dissolve the unholy alliance between corrupt business and corrupt politics is the first task of the statesmanship of the day.” The platform also called for a number of labor reforms and the creation of a social safety net. Populism did not always have such noble connotations in the United States. Andrew Jackson is perhaps best known for his brutal policies against Native Americans culminating in the Trail of Tears. Many of the populists of the late nineteenth century adopted xenophobic and racist overtones like the Democratic Party of that era. Bryan even gave a speech at the 1924 Democratic National Convention against a platform item that sought to condemn the Ku Klux Klan. No Democratic politician better epitomizes this shift than Thomas Watson of Georgia. In 1896, Watson advocated for an alliance between poor whites and African-Americans in the South in the People’s Party based on common economic and class interests. However, by the early 1900s, that populist rhetoric was obscured by xenophobia and nativism, as seen in his magazine’s 1913 anti-Semitic article against Leo Frank, a Jewish factory superintendent accused of murder. Populism became conservative during the Cold War, thanks in large part to Senator Joseph McCarthy. McCarthy and his allies famously attacked elites across the country (and especially in Hollywood) for allegedly being Soviet spies and selling out “real Americans.” Scholars at the time like Richard Hofstadter and Daniel Bell classified McCarthyism as a “populist” movement because of its similar anti-elitism to the nineteenth century movement and the label stuck. In addition to McCarthy, George Wallace sprung to national prominence railing against “pointy-headed bureaucrats” who wanted to desegregate schools. Televangelist Jerry Falwell similarly villainized the “secular humanist” elites who were leading America away from its Christian principles. By the time of the Watergate scandal, it seemed like anyone could claim to be a populist in America. Like many things in modern American politics, Watergate represented a real change from the past. After the scandal, politicians and voters – especially Republicans – began to express more distaste and distrust in government. This trend was seen in the elections of Jimmy Carter (the moral peanut farmer) and Ronald Reagan (the incumbent President who ran as an outsider), and perhaps culminated with the Tea Party movement in 2010. The distrust engendered by Nixon (and by extension the rest of the government) has been slow to recover. In fact, monthly Gallup polling since 1979 has registered over 50 percent satisfaction with the direction of the United States in less that 15 percent of months. These “great challenges” will be examined in a later post, but to conclude, I would like to pose a question that The New York Times (and a number of other outlets) asked: How can Donald Trump and Bernie Sanders both be populists? By describing them both as populists, I by no means look to equate the two or all of their policy positions, merely to categorize a tactic and philosophy they have both utilized on the trail. Both have campaigned vehemently against free-trade deals like TPP and NAFTA, referring to the latter as one of the worst mistakes in our nation’s history because it sold out the average American worker. Both have railed against the establishments – whether they be in the RNC or DNC, Washington or Wall Street, the media or superdelegates – for creating a system that is “rigged” against the common American to the benefit of the “oligarchs” and “aristocrats” who rig it. But, and importantly, Trump’s brand of populism is tinged with xenophobia and isolationism, while Sanders sticks to a populism based on creating economic justice for those who have been left behind. Next Article Populism in Modern America – Why 2016?